Although only a handful of stage adaptations for British television were ever made on location on outside broadcast (OB), the technologies and working practices could also be used inside, as well as away from, the studio. This unusual method of production was utilized in a BBC version of Anton Chekhov’s The Cherry Orchard broadcast on 12 October 1981. Although the production is anomalous, it is worth considering in depth, as it shows a radically different approach to the television adaptation, especially in relation to the potential of the studio as a space for performance and representation, and how the genre might have developed differently in the 1980s. The play came to be shot in such unorthodox circumstances due to the determination of Richard Eyre, a staff producer (and occasional director) for the BBC’s Play For Today (BBC1, 1970-84), to mount the play. Eyre did not have a background in television, but as a theatre director, most recently as Artistic Director of the Nottingham Playhouse, where his productions of new plays by Howard Brenton, Trevor Griffiths and David Hare had attracted much attention and comment. As these writers all had concurrent careers as television and stage playwrights, Eyre was considered to be suitably qualified to produce the BBC’s most high-profile series of original television plays, despite the move across media. As part of his first season at Play For Today, Eyre directed an adaptation of Griffiths’ 1975 stage play Comedians (25 October 1979) one of the directorial successes of his period at Nottingham Playhouse. Keen to continue this collaboration between director and writer, Eyre and Griffiths looked to produce an adaptation of their 1977 Nottingham Chekhov adaptation, which only ran for four weeks, for the wider television audience. Because of the play’s non-contemporary origin, it lay beyond the remit of Play For Today, and slots could not be found for recording at the BBC, the established Play of the Month (BBC1, 1965-83) and the BBC Television Shakespeare (BBC2, 1978-85) series taking precedence. A year later, the play was recorded under a slot booked for Play For Today (although not transmitted under that title), with the concomitant smaller budget and time available for a contemporary single play (Poole and Wyver, 1984, pp. 155-6). Consequently, the play was shot with two cameras on OB equipment. This different approach gives The Cherry Orchard a very different feel to any other adaptation, a flexibility of camera movement that creates more tightly arranged, and more choreographed, scenes than were made with mixing between multiple cameras. Restricted studio time would still remain a central problem but with full rehearsal and detailed preparation, the project did seem feasible. With the committed co-operation of [senior cameraman] Geoff Feld and lighting designer Howard King, the technique was made to work. Each shot was framed and lit individually, mostly using just a single camera, and these brief sequences were then edited together in the post-production process. This description gives a slightly misleading impression of how the narrative of The Cherry Orchard is arranged. Instead of a mosaic of brief fragments, most shots are actually very long and uninterrupted, with occasional cutaways of close-ups of faces in reaction or speaking. These lengthy shots are unlike previous studio productions in part because the lightness and mobility of the OB equipment allowed for cameras to operate within a four walled set, as in the first act where the camera moves into the house through the door and then follows events by crossing into the main room. This sense of the interiors of the house as being an actual lived space is augmented by the different texture of the OB videotape stock, which has a softer grain than conventional studio videotape, feeling more like 16 millimeter film, and therefore bearing close affinities to the viewer’s expectations of filmed drama. Although the sense of vividness and contrast of familiar VT is then sacrificed, the lighting in The Cherry Orchard is softer than in other adaptations, the use of white light streaming in through windows in acts one and four, and candlelight in act three, creating a sense of reality and actuality of location for the viewer, a useful emphasis in a play about the sale of a property. I did Cherry Orchard because I felt that its meanings had been seriously betrayed, almost consciously betrayed, over forty or fifty years of theatre practice in this country. With this intention, Griffiths reworked the play in two ways. 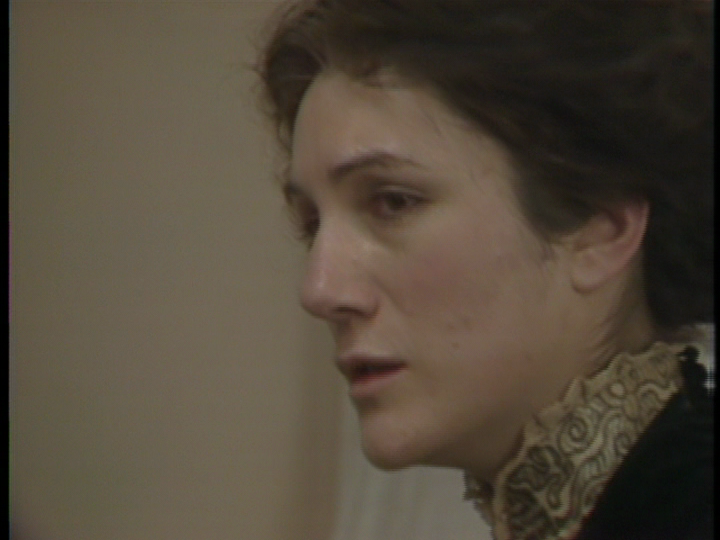 The first way was through a reduction of exposition, informed by seventy-three subsequent years of cinematic storytelling after Chekhov wrote The Cherry Orchard, allowing characters to explain their feelings though fractured half-expressed thoughts rather than in formal sentences (Allen, 1993, p. 161), an approach that is supported in the television version by Eyre’s ability to use cinematic close-ups of characters in reflection, allowing the viewer a sense of insight into the characters’ interior lives. The second reworking was in adjusting the hierarchical structure of the play’s casting, Eyre emphasizing in rehearsal that The Cherry Orchard depicted the spectrum of society in twelve characters of equal importance (Allen 1993, p. 156, Poole and Wyver, 1984, p.155). This intention can perhaps be made clearer in a television staging of a play than in a theatrical one due to the director’s control over the selection of shots that the viewer sees. Eyre’s Cherry Orchard is a production that emphasizes the collective to a degree that is unusual, an effect achieved through long takes of long shots of multiple characters entering and exiting rooms and interacting. Within this structure that emphasizes the company in most shots, the filmic editing into the action of infrequent close-ups then bears much more weight, and appears to carry more directorial intention, than in a conventional camera rhythm of establishing shots, two shots, reaction shots, etc. The two characters whom this technique most accentuates in Eyre’s production are Lopakhin the buyer of the estate, and Trofimov, the marginalized student with radical sympathies, both of whom are essential to a materialist interpretation of the play. The close ups of both character’s reactions, especially to Madame Ranevsky, allows the viewer to develop understanding into these character’s situations and their feelings towards others, and militates against the tradition of cruder portrayals of them as, respectively brutish interloper and student layabout. This emphasis upon the collective affects the way that actors’ performances are read by the viewer of The Cherry Orchard, and the long continuous takes mean that more subtle nuances and gestures of individual performers can be submerged in this production. Actors were unfamiliar with Eyre’s methods, and felt that details of performances were lost with the absence of conventional multi-camera studio close-ups. In the scene in act one where Madame Ravansky receives and tears up a letter from a lover in Paris, Judi Dench added the detail of her gathering up the scraps of paper and putting them in her handbag to keep, an incident which is undetectable to all but the most attentive viewer of this production (Amory, 1981, p.25). Griffith’s intention for the adaptation was to avoid the potential for “operatic” characterization, as realized in long solo performances of angry or longing speeches that direct the viewer’s attention towards the performance at the expense of the society, a tendency that is further discouraged by Eyre’s camera technique, but this approach also makes the depiction of very subtle, close up, acting quite difficult to achieve at times. 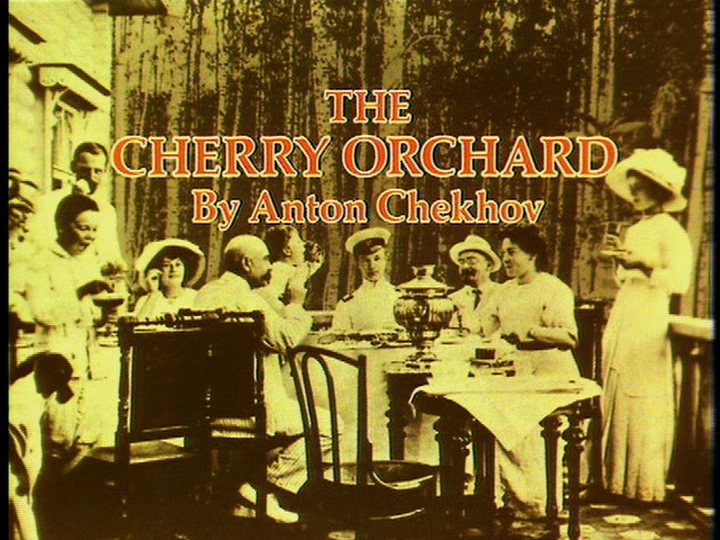 The 1981 production of The Cherry Orchard has a specific place in the canon of the stage adaptation, not just because of its anomalous production practices. Through using the play to explore a particular materialist thesis it demonstrated how the adaptation could be used to a specific aim while remaining faithful to the source text. Aesthetically, through its more solid sense of location, muted colour and lighting and precise directorial arrangement of shots, Eyre’s Cherry Orchard feels less rooted to its time than most other stage adaptations of the period, while still being made in the television studio. The use of lightweight cameras and cinematic editing gives the production strong affinities with contemporary television drama production, showing how the genre of stage adaptation might be developed in the present day. Allen, David, ‘’The Cherry Orchard’: a new English version by Trevor Griffiths’, in Chekhov on the British Stage (ed. Miles, Patrick), Cambridge: Cambridge University Press, 1993, pp. 156-168. Amory, Mark, ‘The Axeman Cometh’, Radio Times, 10-16 October 1981, pp. 23-5. Chekhov, Anton, The Cherry Orchard (trans. Griffiths, Trevor), London: Faber & Faber, 1989. Elsom, John (ed), Is Shakespeare Still Our Contemporary?. London: Routledge, 1989. Gilbert, W. Stephen, ‘Closed Circuits’ in The Guardian, 17 October 1981. Griffiths, Trevor, ‘Preface’, in The Cherry Orchard (Chekhov, Anton, trans. Griffiths, Trevor), London, Faber & Faber, 1989, pp. 1-3. Poole, Mike & Wyver, John, Powerplays: Trevor Griffiths in Television, London: BFI, 1984. Williams, Raymond, Drama from Ibsen to Brecht, London: Pelican, 1973. Willis, Susan. The BBC Shakespeare Plays. London: Chapel Hill, 1991. Wyver, John, ‘How “the Best Play of the Twentieth Century” Took To The Air’, City Limits, 9-15 October 1981, pp. 50-3. This move between theatre and television production can also be seen in David Jones’ move from the artistic directorship of the Royal Court Theatre to BBC producer of Play of The Month in 1977. See Don Taylor, ‘Pure Imagination, Poetry’s Lyricism, Titian’s Colours: Whatever Happened to the Single Play on British TV?’, New Statesman, 6 March 1998, pp.38-9. for a defence of the unique aesthetic qualities of videotape. Griffiths justified the prevalent practice of adaptation in television drama with reference to Brecht’s career being based around the reinvention of existing stories, every reinterpretation creating a different ideological result unique to its adaptor (Gilbert,1981). This entry was posted in Single Plays and tagged Anton Chekhov, Cherry Orchard, Outside Broadcast, Play for Today, Richard Eyre, Trevor Griffiths. Bookmark the permalink.